In a world of the future where a country has been divided into five factions that divide five different groups of people depending on the way that they think, sixteen year old Beatrice Prior prepares for a once in a lifetime event, the choosing ceremony. In the ceremony, youths that have reached the age of sixteen can decide their future by selecting which one of the five factions that they belong. Each faction represents the values and beliefs that the people in that faction have. Whichever faction they choose to be in, whether it is the one that they already were in with their families or if they decide to transfer to a different faction, is the one that they are required to stick with and follow for the rest of their lives. Before the choosing ceremony, each sixteen year old takes an aptitude test to first discover in which faction they seem to belong. The aptitude test usually never fails to identify which faction each individual that is tested belongs, but some special people call the Divergent have minds that think in a more widespread way, and therefore they can get a test result that shows that they belong in several different factions. Beatrice soon discovers that she is one of these special people, and in the choosing ceremony, she must make a huge decision. She could stay with her family, or she could leave to another faction that she prefers and abandon her family. However, since she is one of the Divergent, she soon finds that there is much more to worry about than her faction. Divergent by Veronica Roth was hard to put down once I started reading because the world within the book was described and created with many details and much thought that made me want to know more about what was going on in the story. The setting and story was interesting and engaging, and although it was somewhat unique in a way, I must mention that the plot and setting were very similar to others that I see everywhere. 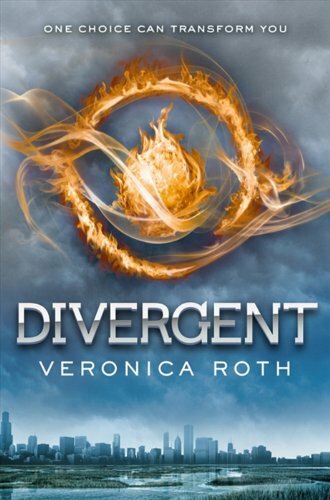 The main character is Beatrice Prior, who starts in the beginning of the book as an unaware, cowardly, and nervous girl and gradually learns more and more about herself while gaining more self-confidence and knowledge about her surroundings, and eventually becomes a completely different person. The best part of the book is hard to point out, but I think it is at the end when Beatrice faces her true enemies. The book is easy to understand and follow, but it contains little vocabulary that is eighth grade level. I think that this book is best suited for ages thirteen to sixteen mostly because of violence and romance. Overall, I would give this book eight stars out of ten. 1. What are the five factions and what do they represent in the book Divergent? 1a. The five factions each represent action that goes against one of the five reasons that people mainly believed to have caused humanity failure. Abnegation represents the people who focused on selflessness, Candor represents those who focused on honesty, Dauntless represents those who focused on bravery, Erudite represents those who focused on the importance of knowledge, and Amity represents those who focused on the importance of kindness and peace. 2. Why is Beatrice’s aptitude test results unique and what are people like her called? 2a. Beatrice’s aptitude test resulted with three factions, Erudite, Abnegation, and Dauntless, instead of one, which is very unusual. People like her are called Divergent. 3. Why does Beatrice change her name to Tris? 3a. Her name did not sound like a name that someone in Dauntless would have, so after she chooses Dauntless as her faction, when she has the opportunity, she changes it to Tris. She also wanted to start a new life with a new name and a new faction. 4. In Dauntless, what are the points that are earned or lost in the three stages of initiation used for? 4a. The points can be earned or lost depending on the initiates’ performances on each stage of the initiation and at the end, only the people who made it to the top ten highest scoring points can become true members of Dauntless. Otherwise, they end up factionless. 5. What is shown about Four and Eric when they are choosing people to be on their teams for capture the flag? 5a. Eric chooses the more broad and strong people, showing that he is ruthless, but Four chooses the people with a smaller narrower body type who are faster, showing that he is smarter since speed is important in capture the flag. 6. Do Tris’s parents visit her on Visiting Day? What do they talk about? 6a. Her father is apparently too upset to visit her, but her mother comes for her and talks to her about family matters and that she knows about Divergent. 7. What is the “initiation ritual” and who leads Tris on this trip? 7a. Uriah leads Tris to a tall building, where they all excitedly zipline down and through the city. The trip is usually only supposed to be for the relatives of senior Dauntless and the seniors themselves. 8. What is the second stage of initiation? 8a. The initiates are tested in a simulation within their own mind, which is almost like the aptitude test. The simulation triggers the person’s fears and the person needs to come out of the simulation in the least time possible by using any means necessary that they can think of, since it is not real. 9. Who attacks Tris after seeing that she is first place for the second stage of initiation. Who saves her? 9a. Peter, Al, and Drew attacks her. She is saved by four, who happened to be passing by the chasm and heard her scream. 10. What is the first fear that Four and Tris face inside the fear simulation? 10a. The fear of heights. Four and Tris stand high enough above the ground to see the city unfold beneath and around them. 11. Why is Four called “Four”? 11a. He is called “Four” because he has only four fears, which is impressingly less than half of the average amount of fears that most people have. Also, he is probably using a nickname because he did not want everyone to know that he is Tobias, who got Abnegation as the final aptitude test result, but he still chose to transfer to Dauntless. 12. Does Caleb feel happy to see Tris when she goes to visit him? Why? 12a. No, it almost seems like Caleb hates Tris for choosing dauntless over any other faction since he thinks that Dauntless is a useless faction. He also becomes brainwashed to think and have opinions like an Erudite, and to Tris’s horror, he starts to badmouth Abnegation, their beloved former faction. 13. Why does Erudite hate Abnegation? 13a. They detest Abnegation because Abnegation is the faction that currently governs the country and they think they need to live with prosperity, unlike the selfless Abnegation, who see prosperity as a self indulgence and therefore go against it. They think that Abnegation is not doing anything that would help anyone by being selfless because their opinions differ so much. Also, the Erudite think that they are more worthy of being the governing faction because of their intelligence, and they want more power, but Abnegation, which is the current governing faction, is in their way. 14. What does the simulation serum that Tris’s mother warned her about do? 14a. After it is secretly injected into every Dauntless it allows Jeanine, the leader of the Erudite, to to take control of them and use them as an army to use against Abnegation. 15. What happens to Tris’s parents in the end? 15a. Her father seems no longer willing to accept that Tris is his daughter after seeing how different she is, but he still does whatever he can to help on her plans to stop the simulation. However, in the end, Tris’s mother and father both die in their attempts to save Abnegation.